Data loss, due to theft or carelessness, can greatly harm any company. Data is a crucial asset for every organisation and with the new General Data Protection Regulation (GDPR) becoming law in 2018, EgoSecure helps you understand your own data-security situation and then specifically protects you against the risks that are genuinely relevant for your business. To make sure that protective measures are implemented optimally, the Insight module first determines the user´s overall safety situation in the corporate network. The results of this analysis are then processed according to management needs and shown in graphs and tables. Thus Insight provides the facts to show an overall picture of the data security for every business and organization. The display is cumulative, so that conclusions about the activities of individual users are not possible. The data shown this way are optimal to specifically establish the protective measures that are really needed. The new module IntellAct analyses the facts from Insight and automatically activates protective measures based on predefined rules. In addition, it can make comparisons with benchmarks, automatically detecting anomalies and critical situations so that an appropriate response is triggered to protect an organization´s data. This automation greatly facilitates the work of administrators and minimizes reaction times considerably. With INVENTORY can be seen which hardware and software products are installed on the computers in the corporate network. However, the functions in INVENTORY that allow to see changes and to analyze those and also to be alerted if something changes, are much more important. The condition of the hardware can be displayed and reliably indicate any problems. Employees no longer have to write down their passwords and logins on Post-It’s or in word files – this task is now taken over by the secure Password Manager. Even when creating complex passwords, the password manager can support through an intelligent process. It is also possible to exchange logon information with colleagues by storing the protected Password Manager files in the network. Secure Erase ensures that deleted files cannot be restored, no matter if they are located on the internal hard disk or on an external storage medium. Users can choose among multiple deletion methods. They have the option to securely delete documents immediately or to destroy all deleted files irrevocably, based on a specific schedule. Secure Erase also ensures that you discard hardware only when you sell or withdraw respective hardware. Intelligent power management ensures efficient device operations by ensuring that energy is only consumed when the computer is actually used. Power Management helps to reduce IT operational costs while also contributing to the company’s environmental balance and ensuring a fast ROI for the EgoSecure Data Protection implementation. Device management allows a clear definition of who can use which devices (e.g. USB sticks, CDs, TV tuner) or interfaces (e.g. WLAN, Firewire, USB) and to what extent. Thus, all of these devices can be used without causing abuse or risking the loss of data. It also prevents malware of getting into the corporate network via these interfaces. Device Management offers effective protection against “attackers from inside”. The use of the cloud has many advantages in terms of flexibility of labour, because data can be accessed anywhere. Particularly sensitive data, however, should not be saved in the cloud and some data types may not even be allowed by law to be saved. Especially in so-called third countries. Cloud Access Control checks which employee is allowed to use which cloud services to which extent. Data transfers are nowadays, in addition to the official channels via the corporate network, possible through many ways – Bluetooth, WiFi, modem, etc. However, a company should control via which routes data leave the company. Connection Access Control checks which employee has access to which data transmission devices. Audit makes the data flow visible in detail, showing potential weaknesses in the security settings. It therefore allows the determination of forensic information. The ability to generate this information is an important contribution to IT compliance and matches with laws and industry regulations. The GDPR, for example, specifies a logging as mandatory. At the same time EgoSecure Insight Audit makes the violation of the privacy rights of employees impossible, since the access to logging data is protected by a 4 or 6 eye principle. An integrated, overall security concept also has to provide options to analyse content, filter sensitive information that leaves the company and block damaged information within incoming data. Our Content Analysis & Filter provides granular and reliable protection of corporate data communications without affecting users‘ workflows and desired data transfers. An antivirus solution provides proven protection against anonymous attackers from the internet. It is important to ensure a high detection rate to be able to respond quickly to new viruses and trojans. 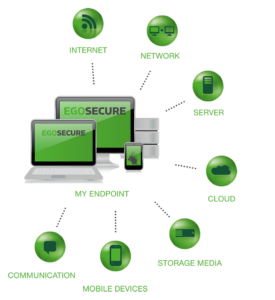 EgoSecure Data Protection integrates a leading-edge solution with an acknowledged high detection rate. 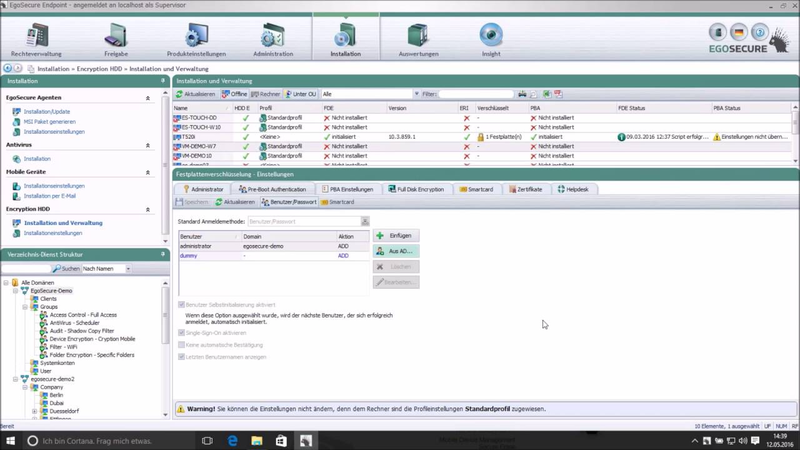 Application Control allows configuration as to which user is allowed to start which programs. For instance, to prevent games or unlicensed software products being used. This way liability risks and economic damage can be avoided. It is also possible to block most viruses before antivirus solutions detect them. DLP (Data Loss Prevention) scans text files which left or were copied to the computer for specific content. This ensures that information such as credit card numbers or other strictly confidential information is not transmitted to the outside world. When a confidential information is found, selected actions can be performed, such as logging or blocking the operation. Mobile media such as USB sticks are important means to support increasingly flexible business and working environments. While devices are shrinking in size and increasing in performance, they are also lost or stolen more easily. Removable Device Encryption ensures that the data cannot be used by unauthorized parties. Password-based encryption and decryption can be achieved on any Windows computer, with full transparency for authorized users. Encryption is file-based, and various encryption types are available (for the whole company, for individual users or for certain user groups). It is possible to use multiple encryption types for one medium. If you'd like to have a chat with us about EgoSecure, please select this option. If you'd prefer to email or phone us, our details are also here.